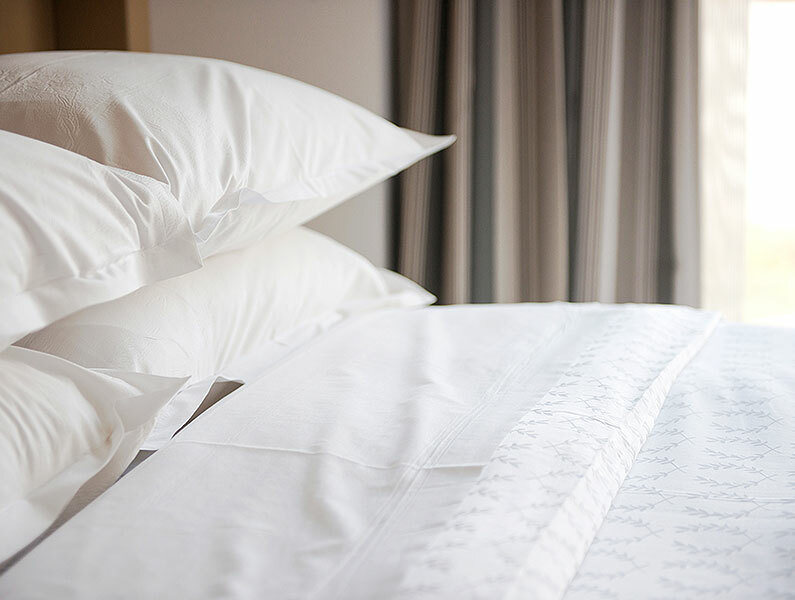 With a touch of craft in every detail, our rooms combine high-tech amenities and high-end fabrics and furnishings. 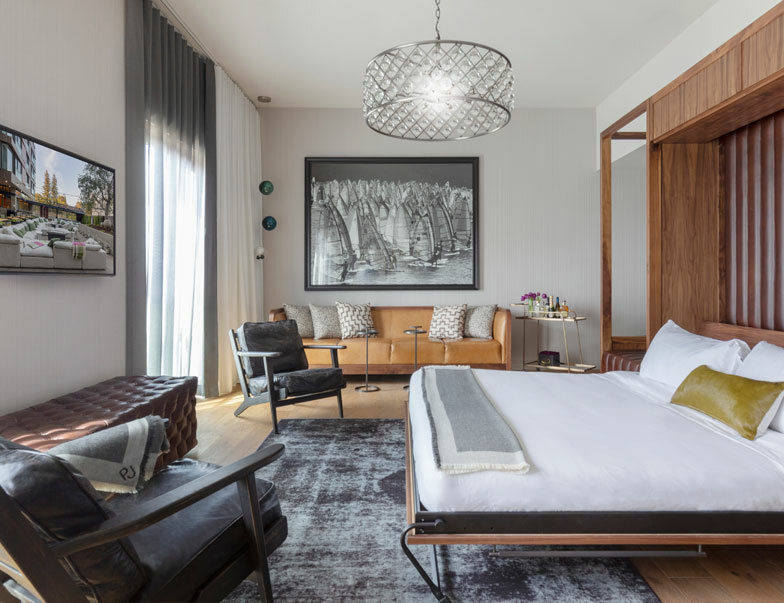 From your in-room tablet, you can adjust the lighting and temperature, order room service or a car, or choose the perfect in-room entertainment for a quiet night at P.J. Feel the day’s work demands slip away the moment you enter this cool, textured retreat. 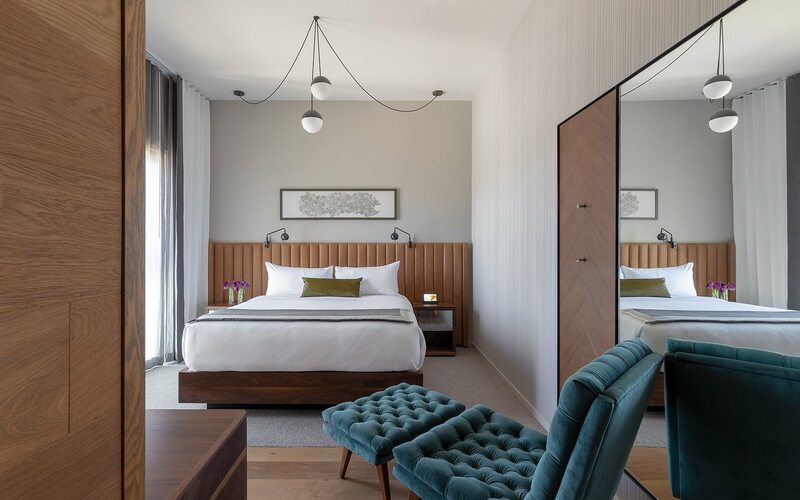 Perfect for solo execs, this room calls for kicking off your shoes on wide plank wood floors and curling up on a modern platform king bed, complete with reading lights placed right where you want them. Hit the snooze button. Daylight is never going to penetrate these floor-to-ceiling windows finished with double-panelled blackout drapes. 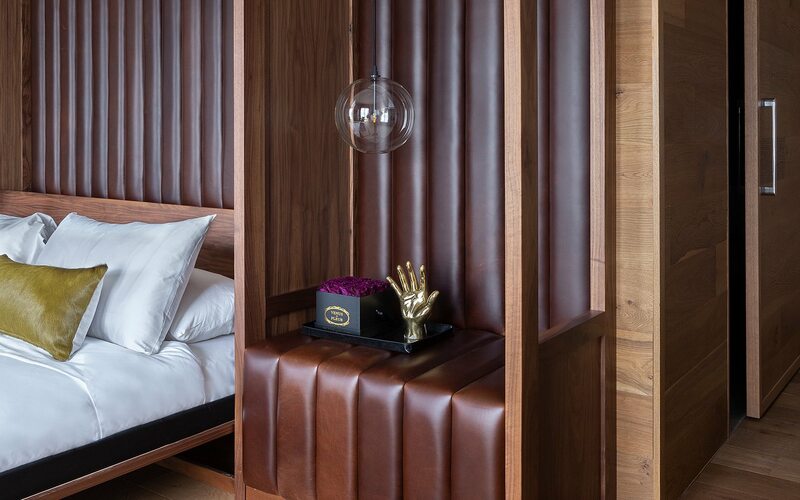 Ideal for families or for doubling up with a work colleague, this sophisticated room is furnished with two comfortable queen beds draped in crisp cotton bedding. 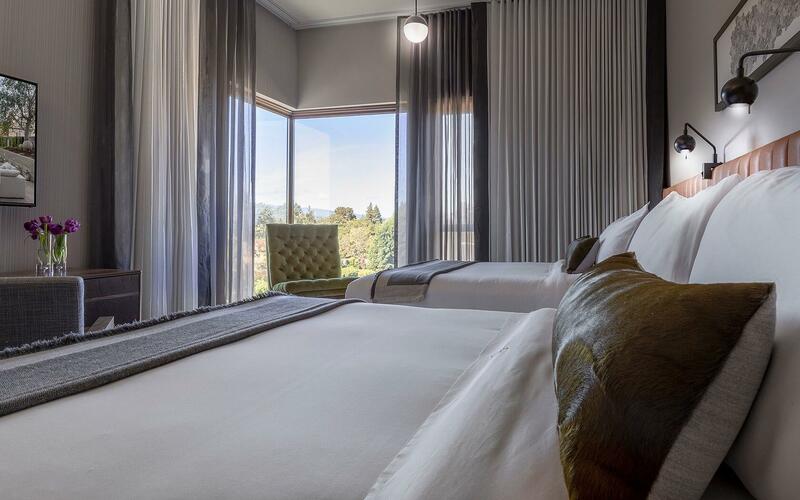 Make this comfortable, residential-style retreat your Menlo Park home away from home. 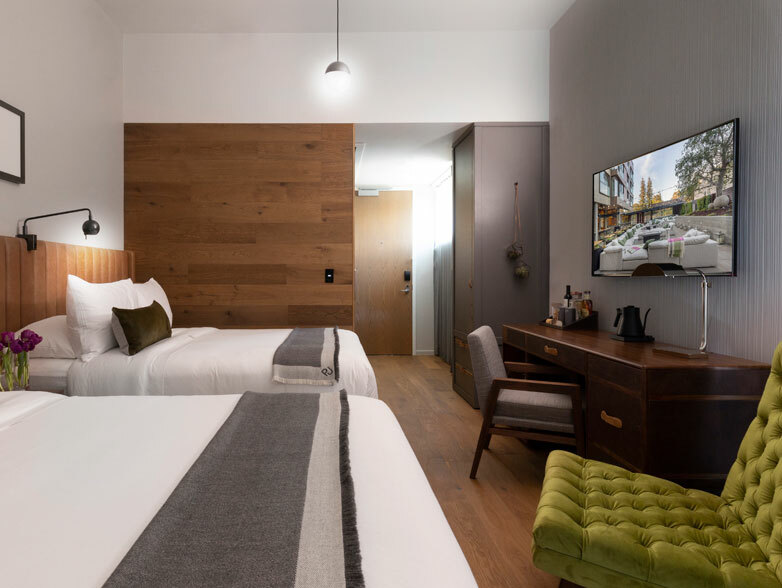 Ideal for an extended stay in Silicon Valley, this uber-spacious suite has separate living and sleeping areas so you can spread out, settle in, and soak up all the California Craft details. 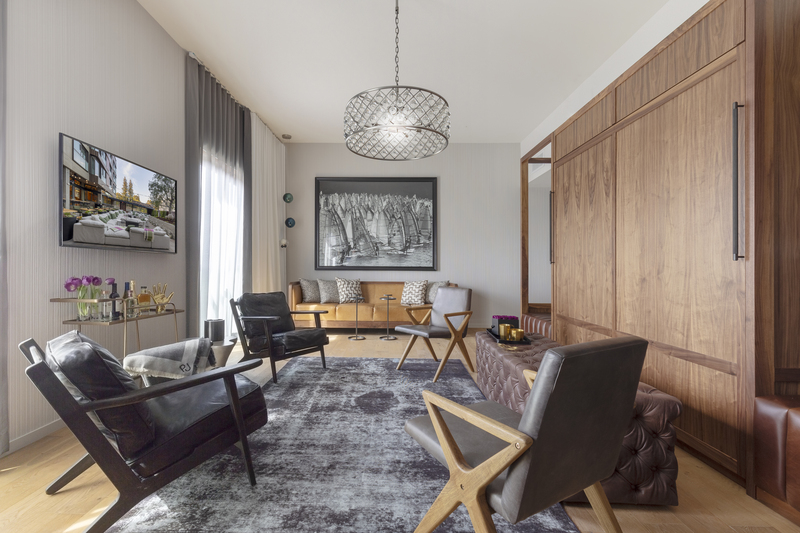 After a long day of meetings, ease into the cool comfort of this modern urban oasis wrapped in soft shades of gray. Ideal for business travelers, this spacious room is furnished with a comfortable platform king bed and all the ADA essentials, including bathroom grab bars and roll-in shower. A perfect room for families or friends traveling together, this sophisticated and spacious retreat has two modern platform double beds, floor-to-ceiling double-panel blackout drapes, and all the requisite accessibility features, including bathroom grab bars and roll-in shower. 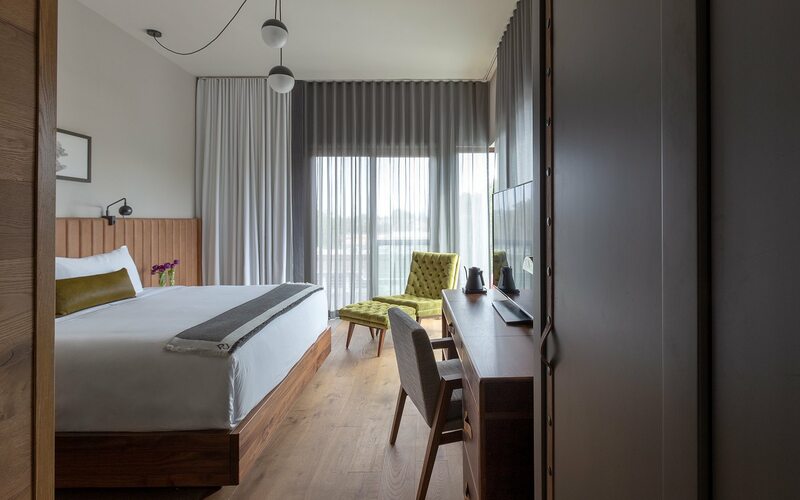 You’ll never trade form for function in our fully accessible residential-style suite featuring separate living and sleeping areas, beautiful wide plank wood floors, and double-panel blackout drapes. Sophisticated custom details include a modern platform king bed with overhead reading lights.